Plastics recycler Axion Polymers (Manchester, UK) has invested a further £1 million this year to optimise materials recovery from end-of-life vehicles at its purpose-built plant at Trafford Park, Manchester – one of the most advanced of its type in Europe. Axion’s in-house engineering team designed, built and now operates the highly-specialised, multi-million dollar Shredder Waste Advanced Processing Plant (SWAPP) jointly with S. Norton & Co. (Bootle, UK), one of the UK’s leading ferrous and non-ferrous metal recyclers. 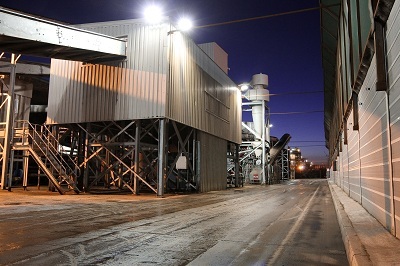 Opened in January 2011, the plant is already capable of delivering over 95% recycling and recovery of materials from end-of-life vehicles (ELVs), ahead of the 2015 EU ELV recycling and recovery target. Axion director, Roger Morton says: “This latest cash injection is part of on-going efficiency optimisation at the facility, which has an annual capacity of 200,000 tonnes of automotive shredder residue (ASR). It enables Axion to separate the non-metallic fractions from the scrap after the primary metal removal has taken place, and is the equivalent of about 800,000 cars a year. As a rough guide, about 30% of a motor vehicle is non-metallic and therefore ends up mostly in ASR. “Although the operation is still developing, we are already delivering the 95% recycling and recovery target through a combination of plastics recycling, producing materials for the construction industry and fuel to substitute coal,” explains Morton. Plastic concentrate is taken to Axion Polymers’ 12,000-tonnes/year Salford plant for further processing into a range of plastic compounds, such as the Axpoly PP51 extruded black polypropylene (PP) pellets introduced in April this year that go to a wide range of customers, including some in the automotive sector, thereby ‘closing the recycling loop.’ Axion operates a 20-stage advanced technology separation process at Salford which was developed in-house. For non-PP plastics, Axion also offers recycled polystyrene grades, while it is also carrying out some initial separation of other plastics commonly found in vehicles such as ABS and polycarbonate. These are offered as mixed engineering plastics. Axplas MEP52 0000, for example, is a PS (43%) and ABS (35%) -rich mixture which also contains PP (15%), PC/ABS (5%) and other materials including minor quantities of rubber and wood. “We are currently test-marketing these grades in to applications which can use them as a mixed material and comparing that route with the cost of further processing and separating into individual polymers,” says Morton. Axion says that the PP recovered from automotive post-consumer waste presents a great opportunity for manufacturers to tap into a stream of truly sustainable materials. Creating new manufactured products using materials resources that are ‘mined’ from closed-loop recycling routes provides a complete ‘cradle-to-grave’ approach for vehicle producers that is both sustainable in the long term and also lower cost. As well as automotive applications, Axpoly PP51 has potential uses in the utility, construction and wider manufacturing industries. “Axpoly PP51 is an example of the new recovery technologies and refining techniques we have developed to satisfy the higher 95% target levels. We are seeing increasing interest from other ELV recyclers in using spare capacity when available on the SWAPP facility as the 2015 deadline for the 95% recycling target draws closer,” continued Morton. The European End of Life Vehicles (ELV) Directive aims to reduce the amount of waste produced from vehicles when they are scrapped. Since 2006, the UK and all other EU member states have been expected to reach a national recycling and recovery target of 85%, rising to 95% in 2015.